In 1869 the State of Indiana founded Purdue University as Indiana’s land-grant university dedicated to agriculture and engineering. Today, Purdue stands as one of the elite research and education institutions in the world. Its halls have been home to Nobel Prize- and World Food Prize-winning faculty, record-setting astronauts, laurelled humanists, researchers, and leaders of industry. Its thirteen colleges and schools span the sciences, liberal arts, management, and veterinary medicine, boasting more than 450,000 living alumni. 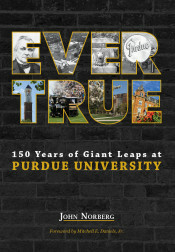 Ever True: Celebrating the First 150 Years of Purdue University by John Norberg captures the essence of this great university. In this volume, Norberg takes readers beyond the iconic redbrick walls of Purdue University’s West Lafayette campus to delve into the stories of the faculty, alumni, and leaders who make up this remarkable institution’s distinguished history. 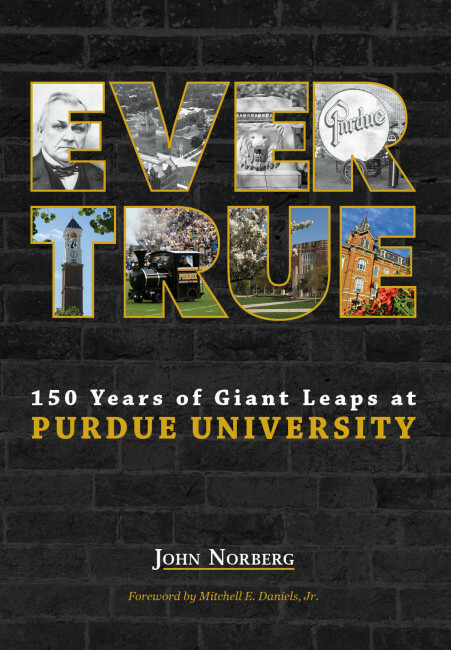 Written to commemorate Purdue University’s sesquicentennial celebrations, Ever True picks up where prior histories leave off, bringing the intricacies of historic tales to the forefront, updating the Purdue story to the present, and looking to the future. A preview of Ever True is available for download here. John Norberg is a writer, author, humorist, and a chronicler of the human condition. Retired as director of communications for development at Purdue University, he began his humor column in 1971 while working at Indiana’s Brazil Daily Times. The column appeared in the Lafayette Journal and Courier from March 1973 to October 2014. He has received more than 50 state and national reporting awards. A nationally respected, award-winning speechwriter and public speaker, he also is the author of seven books, including Spacewalker: My Journey in Space and Faith as NASA's Record-Setting Frequent Flyer, which details the story of astronaut Jerry Ross. Additionally, Norberg has written articles for various national publications, including the Saturday Evening Post, USA Today, the Christian Science Monitor, and Time magazine. He was most recently honored with the prestigious Purdue University Special Boilermaker Award and was inducted into the Indiana Journalism Hall of Fame for a lifetime of work.